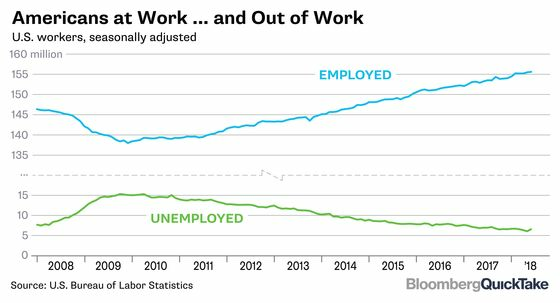 (Bloomberg) -- The U.S. expansion has put millions of people back to work and economists agree that the economy is now at or close to full employment. But what does that mean exactly? When economists talk about full employment, they don’t mean everybody has a job. And they don’t mean that even the rosiest economic health can cut unemployment to zero. If unemployment falls too much, inflation will rise as employers compete to hire workers and push up wages too fast. To economists, full employment means that unemployment has fallen to the lowest possible level that won’t cause inflation. In the U.S., that was once thought to be a jobless rate of about 5 percent. U.S. Federal Reserve economists currently put this so-called natural rate of unemployment at between 4.1 percent and 4.7 percent. All those estimates are above the June rate of 4 percent. Is higher inflation therefore on the way? Or is full employment a smaller number than economists suppose? Since the U.S. recovery began in 2009, total employment has risen from 138 million to 155.6 million and the number of unemployed has shrunk to 6.6 million. As the labor market tightens, the Federal Reserve is debating the timing of its next rate hikes. The problem is that there’s more uncertainty than usual over how many people might start looking for work if labor-market conditions continue to improve, making it hard to pinpoint how much unemployment has to be tolerated to fend off inflation. That’s because the last recession was exceptionally severe and shook the labor market in ways that still aren’t well understood. The government counts as unemployed people who don’t have a job, have “actively looked” for one in the previous four weeks, and are available for work. A wider measure of people needing work would count other potential job-seekers as well. The Bureau of Labor Statistics reported that 1.4 million people were “marginally attached to the labor force” in June — meaning they wanted a job and had looked for one in the previous 12 months, but not in the past four weeks. This included 359,000 “discouraged” workers who have stopped looking because they believe no jobs are available for them. The number of marginally attached workers surged in recent years partly because the recession was so deep and long; it’s likely to shrink as the expansion continues. Other kinds of disguised unemployment may be temporarily high as well. In June, 4.7 million part-time workers wanted a full-time job. A stronger economy might also draw back into the labor force people who retired sooner than they’d intended, or who chose to stop working for other reasons. Economists, including the Fed’s policy makers, are divided about how close the economy is to full employment. To discourage inflation, which is currently running at about the Fed’s target rate of 2 percent, some think that short-term interest rates should continue to rise. Others think the Fed can afford to be patient and that the official rate of unemployment can fall even further before inflation concerns need to be addressed. Others say that changes in wages may be a clearer indicator of labor-market conditions than the post-crash unemployment rate and wages aren’t yet showing clear signs of faster growth. The Fed’s big concern: It’s possible that we won’t know what full employment means until inflation takes off. The Bureau of Labor Statistics has all the data. A paper by economists at the San Francisco Fed asks why wages have grown so slowly. A Fed working paper on the rise in involuntary part-time work. Laurence Ball and Gregory Mankiw survey the non-accelerating- inflation rate of unemployment, or NAIRU, in theory and practice.